I’ve always said Canelo looks like and acts like a pig. Last night I learned some about a pig and had a first ever. 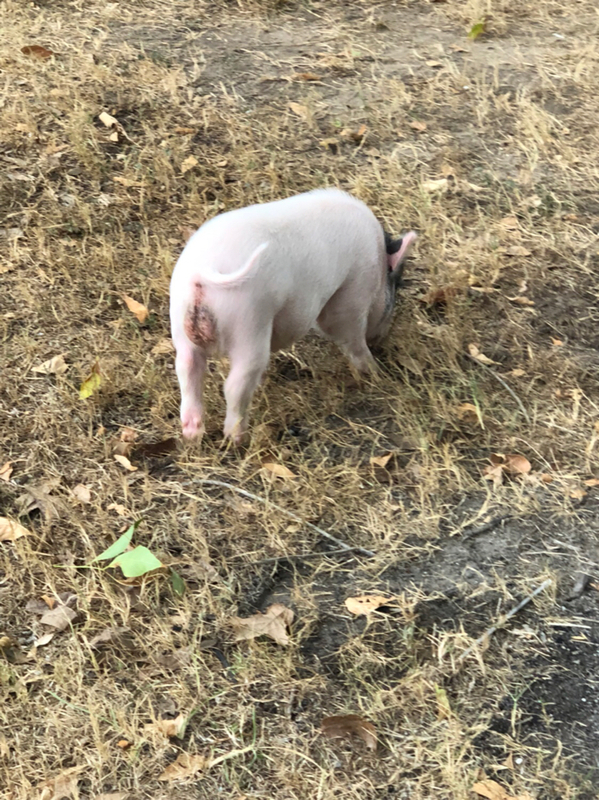 My in laws just got a pot bellied pig and named him Charlie (Bacon would have been a great name). He’s cute but I met him at a birthday party so lots of people around and he was preoccupied with everyone. The party was on the lawn, he did come to me and used that snout to investigate my entire hand, interesting investigation. But the best, most interesting and uncomfortable encounter was he nibbled my toes multiple times!!!!! With teeth! He did it three times, the last time I pushed him away with my foot and said “I’m not lunch!” He moved on but what a new experience. I’ve never come this close to a tiny pig nor felt piggy teeth on my toes, lol! Here is Charlie, he’s a cutie. Piggies are fun but do tend to investigate with their mouth a bit. I have been chomped on more than a few times when helping out the FFA kiddos. Not a back end at all. That's a pair of hams, a couple of hocks and 2 tiny feets. Forget the tail. They are extremely intelligent! Smarter than any dog-(no offense...). If they are overfed, they will grow bigger than they are supposed to. Love piggies! I’ve seen on tv a breeder from UK, he breeds potbelly but miniatures. Seems he’s the only one that does that. Mind you that was a couple years ago... Like really smaller than this little guy. If I lived on property I’d totally have one or two piggies running around.